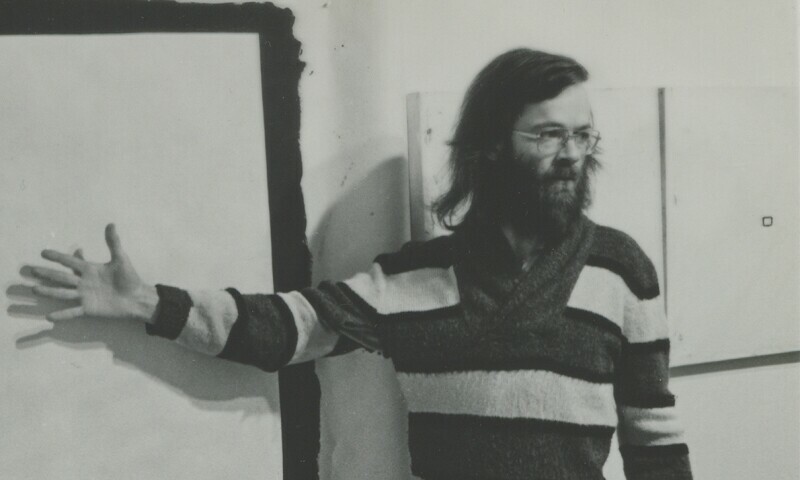 Tony Conrad in front of Yellow Movie 2/2/73 (1973) and two Yellow Movie—35mm Format canvases (1973), in his retrospective exhibition, Hallwalls Contemporary Arts Center, Buffalo, New York, December 1977. Introducing Tony Conrad: A Retrospective marks the first large-scale museum survey devoted entirely to pieces originally presented by the artist in museum and gallery settings. A pioneering artist who helped define American avant-garde in the 1960s and challenged barriers between different mediums through radical deconstruction and experimentation, the exhibition offers a unique opportunity to experience six decades of Conrad’s work. Exhibiting a wide range of seminal pieces, the presentation will expand and deepen an understanding of his experimental and ground-breaking practice, which is primarily associated with his contributions to minimal music and structural film in the 1960s. Bringing together sculpture, painting, film, video, performance, and installation, Introducing Tony Conrad will create a sensory experience that invokes the participatory and performative approach of the artist. Spoken, written, and performed introductions originally created by Conrad to help frame screenings and presentations will be woven into the space, creating a level of active engagement that breaks down and invites an unprecedented reexamination of the boundaries between artistic categories.